This list is not exhaustive. The explanations provided below should not be a substitute for consulting your personal physician. If you are suffering from severe pain, have your personal physician contact Pain Management. Degenerative disc disease (DDD) is part of the natural process of growing older. As we age, our intervetebral discs lose their flexibility, elasticity, and shock absorbing characteristics. 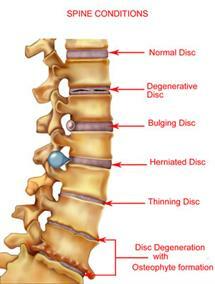 The ligaments surrounding the discs become brittle and are torn more easily. These factors can all contribute to degenerative arthritis of the spine. The symptoms of DDD include back pain, leg pain, and weakness that are due to compression of the nerve roots. Towards the end of the day, people typically report back pain and stiffness. Individuals may also experience a pain that seems to travel down your back, through your buttocks, and down your leg. Doctors refer to this as sciatica. Facet arthropathy simply means a disease or abnormality of the facet joints. The facet joints connect the posterior elements of the vertebral bodies to one another. These joints are covered in smooth cartilage and surrounded with ligaments. The facet joints can become arthritic and painful just like any other joint in the body. Most people who have facet arthropathy will report low back pain that worsens with movement of the spine. The pain normally does not radiate from the back to the buttocks and down the legs as in sciatica and pain cause by a herniated disc. As facet joints become arthritic, they will often develop bone spurs that decrease the space available for the nerve roots as the exit the spinal canal which causes more pain. Herniation descibes an abnormality of the intervertebral disc that is also known as a "slipped," "ruptured," or "torn" disc. Pressure on a spinal nerve from a herniated disc will cause pain in the part of the body that is served by that nerve. Herniated discs usually occur because of normal wear and tear or an injury to the spine. The most common symptom of a herniated disc is sharp, cutting pain. Low back pain will almost always be present and sometimes pain will radiate into other parts of the body. The onset of pain with a herniated disc may occur out of the blue or it may be announced by a tearing or snapping sensation in the spine. The lumbar spine (lower back) provides a foundation to carry the weight of the upper body and also houses the nerves that control the lower body. Degenerative changes are a result of normal wear and tear associated with aging. Over time, these changes result in the narrowing, or stenosis, of the spinal canal. It usually affects middle-aged and older adults. Regular exercise helps to keep the spine strong and prevent low back pain. Narrowing of the lumbar spinal canal pinches the nerves that control muscle power and sensation in the legs. Stenosis can also diminish the spine's ability to carry the load of the upper body. Typically, patients will experience pain in the low back over a prolonged amount of time that gradually becomes worse. Symptoms are usually worsened by standing or walking upright. Pain is usually relieved by sitting down or leaning forward. Radiculopathy is a term that describes pain in your arms or legs that are caused by a problem with your nerve roots. This disease is often caused by pressure from a herniated disc or degenerative changes in the lumbar spine as a result of aging. The number of roots that are involved can vary and it can also affect both sides of the body at the same time. The most common symptom of lumbar radiculopathy is sciatica. The pain can vary from very dull and difficult to localize to sharp and easy to pinpoint. Radiculopathy can create hypersensitivity to touch as well as numbness in the area of skin that is supplied by the nerve root. Numbness, tingling, and weakness in your leg muscles in the presence of back pain are warning signs of radiculopathy. The sacroiliac joint is located in the low back between the spine and hip joint. Sacroiliac joint pain is usually located in the low back and is usually one-sided. Typically, people with this disorder find it difficult to find a comfortable position while lying in bed. The pain often radiates down to the knee. 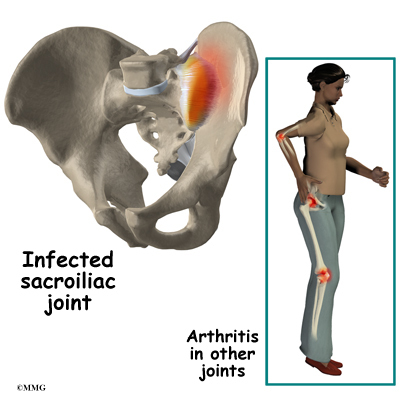 A woman in her 30s or 40s who has had children is a good candidate for sacroiliac joint pain. For more information, read the April 2008 newsletter. The sciatic nerve is the longest nerve in your body. It runs from your spinal cord to your buttock and down the back of each leg. Sciatica is pain that radiates along the path of this nerve. 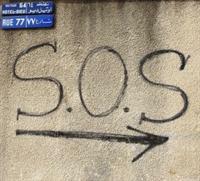 Sciatica is not a disease, but a painful symptom of another problem involving your nerves. Spondylolisthesis occurs when one vertebra slips forward on an adjacent vertebrae. This produces a gradual narrowing of the vertebral canal as well as a deformity of the lower spine. There are five major types of spondylolisthesis. Many patients with spondylolisthesis will have vague symptoms and very little visible deformity. The most common symptom of spondylolisthesis is low back pain. Pain is usually relieved by extension of the spine and made worse when flexed. In addition to back pain, people commonly report leg pain.